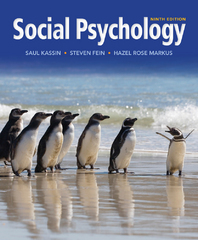 Social Psychology 9 Edition Distinguished by its current-events emphasis, the aim to bring the outside world into the field of social psychology, strong diversity coverage, and engaging connections drawn between social psychology and everyday life, SOCIAL PSYCHOLOGY, Ninth Edition, remains one of the most scholarly and well-written books in its field. Integrating classic and contemporary research, the book also includes comprehensive coverage of social cognition and evolutionary psychology, and features authoritative material on social psychology and the law. Coverage of culture and diversity is integrated into every chapter by Hazel Rose Markus, a leader and respected researcher in the study of cultural psychology. Available with InfoTrac Student Collections http://gocengage.com/infotrac.